Imagine interacting with your smartphone without even touching it. Imagine waving your hand or pointing your finger to perform tasks on your smartphone. Better still, imagine interacting with you smartphone using your eyes! If only you could change the music by waving your hand or feet or view photos by pointing at your smartphone. Wouldn’t it be cool if you could wave your hand over the smartphone to check the time? Sounds interesting, doesn’t it? I was wondering if touchscreens on smartphones will eventually become ‘gesture-screens’ and whether all user interaction will be devoid of the ‘Touch’. Is gesture-based user interaction the future for smartphones and tablets? Actually, the future is already here! 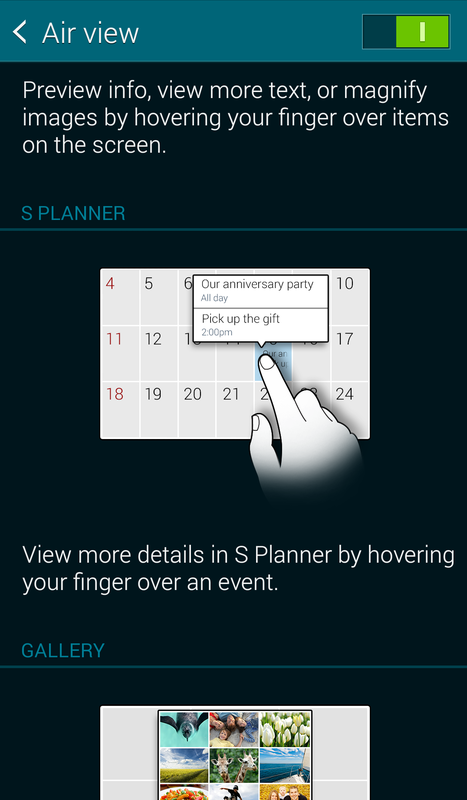 Gesture-based user-interaction was implemented in the Samsung Galaxy S5. There’s a lot more you can do with gestures than with just touch. You can use your eyes, head, hands, feet or any part of your body to navigate through your smartphone or tablet. Let’s look at a few cool features of the Samsung Galaxy S5’s gesture-based user-interaction. The Air view feature gives you a ‘Preview’ of the particular UI element by just hovering your finger over it. 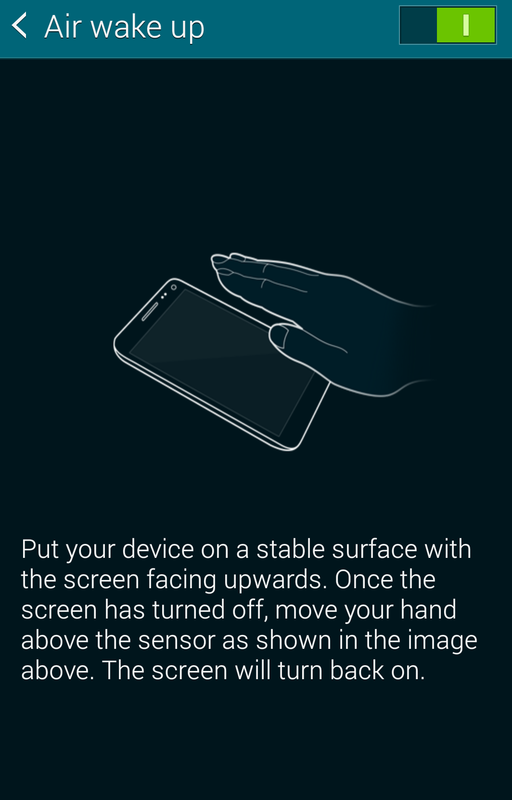 You must turn Air view on before previewing using gestures. Go to Settings > Motion and Gestures > Air view. Switch Air view On. This feature allows you to preview photos, events, speed dial numbers, text messages etc. In the above photo, I am ‘Air viewing’ a particular photo in my album. Instead of navigating through all the photos, I just need to hover my finger on all photos one at a time for a quick preview. 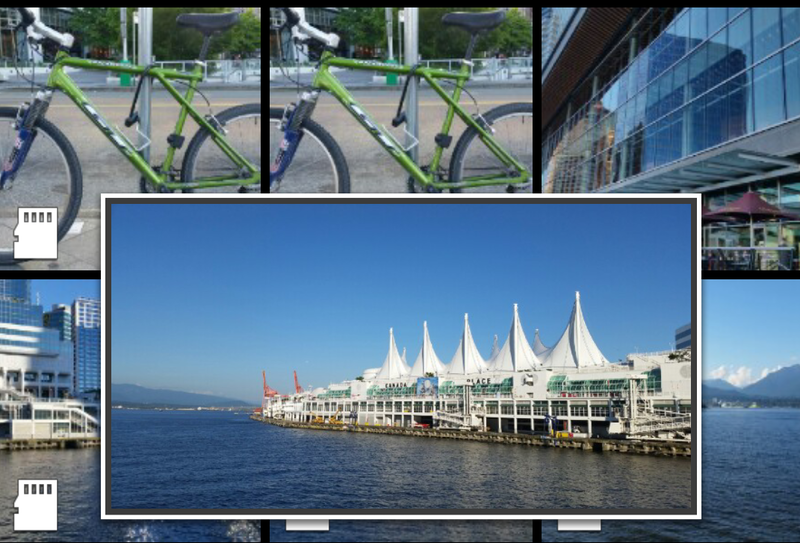 This feature is very useful and saves a lot of time in finding the right photo to upload or share. 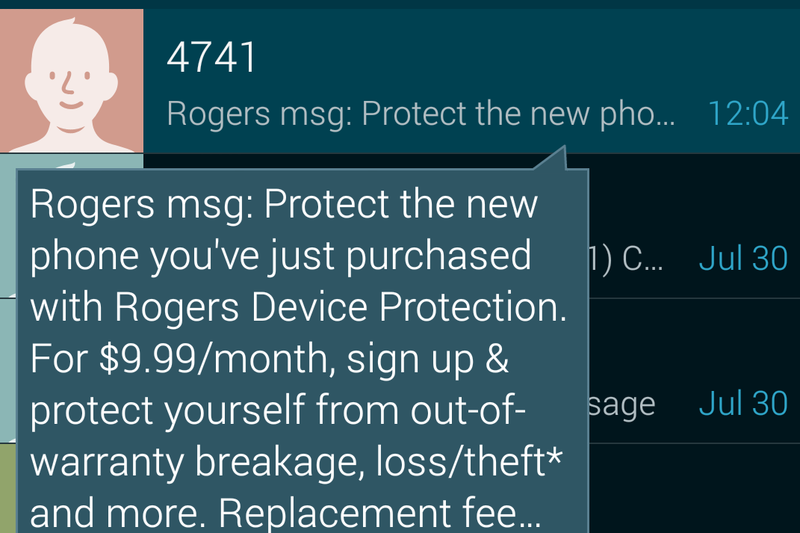 In the above image, I just hovered on a text message to view the message. I don’t really need to click and view the message. This is a convenient way to navigate through all text messages. Imaging being able to navigate through photos or music by just swiping your palm over the phone without even touching it! Air browse lets you do just that. You must turn Air browse on before being able to browse using gestures. Go to Settings > Motion and Gestures > Air browse. Switch Air browse On. This feature lets you change music even when the screen is locked. Just wave your hand on the screen and you can change tracks right away. Generally, once a smartphone goes into sleep mode, the only way to wake it up is to click the power or home button (depending on the model of the smartphone). Samsung Galaxy S5 provides an awesome feature where you can hover your palm on the proximity sensor and it automatically wakes up the device. You must turn Air wake up on before being able to wake up your smartphone using gestures. Go to Settings > Accessibility > Dexterity and interaction > Air wake up. Switch Air wake up On. This feature is useful if your hands are wet or you don’t want to touch the phone at night but you want to quickly check the time. This is also a quick way to check updates within the widgets on your home screen. Imaging being able to scroll through a web page by tilting the device or your head. Smart scroll does just that. 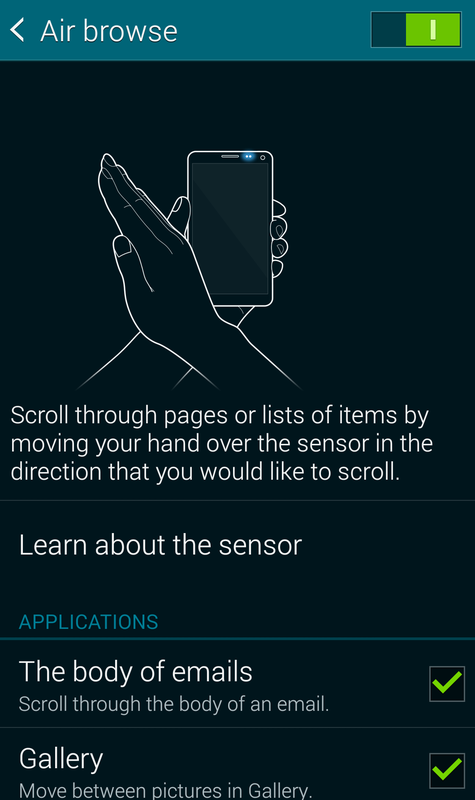 You must turn Smart scroll on before being able to scroll using gestures. 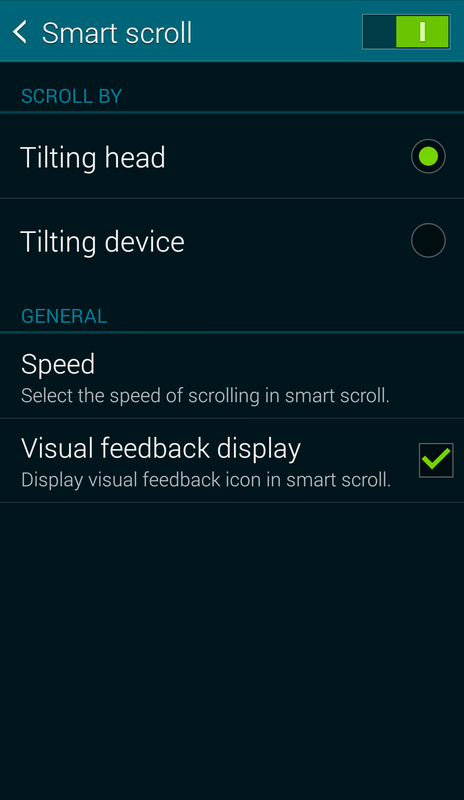 Go to Settings > Accessibility > Dexterity and interaction > Smart Scroll. Switch Smart scroll On. You can either choose to navigate by tilting the device or tilting your head. I’m sure this has happened to you – you look away from the movie you are watching on your smartphone, and you miss the action! If only there was a way to pause the movie on your smartphone every time you looked away. Smart pause lets you do just that. 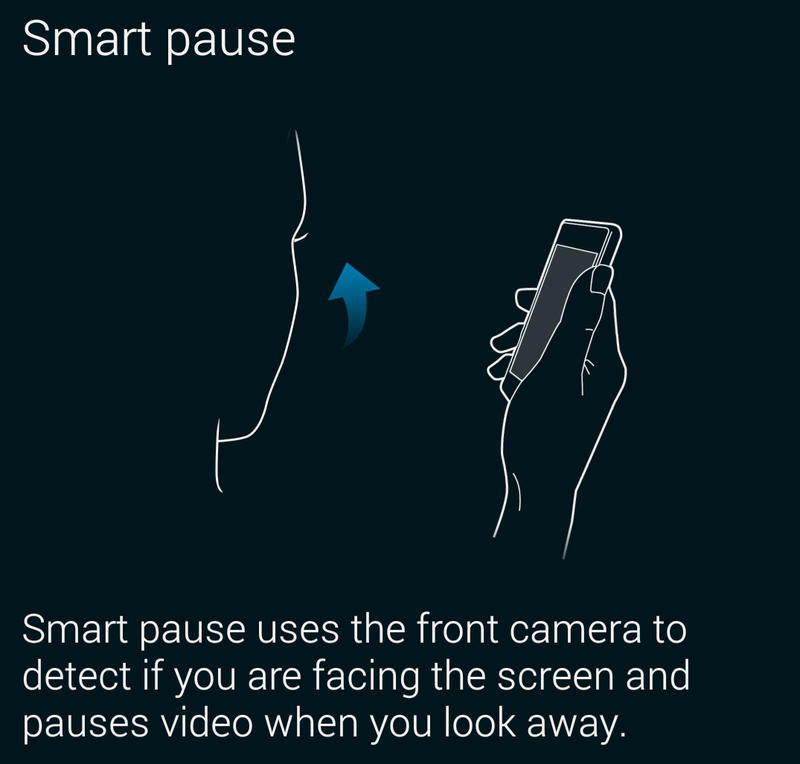 Samsung Galaxy S5 has a feature where the video pauses automatically when you look away! To enable Smart pause, go to Settings > Motion and Gestures > Mute/Pause. Switch Mute/Pause On. Select the Smart Pause check box. These amazing features make me wonder whether Is it really the end of the ‘Touch’. It’ll be interesting to see how gesture-based user-interaction improves over the coming years. With cut-throat competition amongst smartphone companies, new ways of user-interaction will become unique selling features. It will be interesting to see who wins in the end. At the moment, I see only one winner – and it is you, the user. Because you can now use your smartphone without touching it! Disclaimer: The Digital Dimension of Technology is an independent non-commercial technology blog. We have not been endorsed by Samsung or Google (Android). ← Is Your Printer ‘Cloud Ready’?